Welcome back, TVR. You’ve been missed. After a 12-year absence from the auto industry, TVR is finally back with this: presenting the new V8-powered, 200 mph Griffith, TVR’s first car since the company was taken over by computer games entrepreneur Les Edgar in 2013. Revealed at today’s Goodwood Revival, it represents the first time the British automaker has adopted the Griffith moniker since the last model finished production in 2002, arguably one of the most iconic model names in TVR’s chequered history. The timing couldn’t be better: in an age where cars are becoming more conservative, we need an outlandish automaker like TVR right now. Sporting a sleek shape, the reborn Griffith looks like a contemporary two-seater sports car yet still retains classic TVR design traits, namely its clean, swooping silhouette inspired by the original 1960s Griffith and the Tuscan. Prominent side exhausts and 19-inch alloys add some aggression to the car, while deep air intakes located on either side and a rear diffuser provide plenty of downforce. The overall design isn’t as extreme as some of TVR’s later models like the Sagaris, but the Griffith still looks undeniably stunning from every angle. As you probably already know by now, the Griffith is powered by a naturally-aspirated, 5.0-liter Cosworth V8 engine that sends 480 horsepower to the rear wheels through an old-school six-speed manual gearbox. It’s front-mid mounted and dry sumped, creating a low center of gravity and a perfect 50:50 weight distribution. 0-62 mph takes less than four seconds, and the Griffith will go on to a top speed of over 200 mph. It’s remarkably light, too, with a dry weight of just 1,250 kg resulting in a power-to-weight ratio of 400-hp-per-tonne. 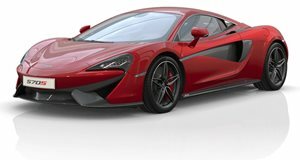 That puts it in McLaren 570S territory. We have the legendary Gordon Murray, who helmed the design of the McLaren F1, to thank for the Griffith’s lightweight construction. The Griffith is the first production car to utilize Murray’s revolutionary iStream construction technique, which streamlines the manufacturing process with pre-assembled parts to cut costs and build cars more quickly. Its chassis consists of a tubular steel frame with bonded carbon-fiber panels providing extra rigidity. The Griffith also has double wishbone suspension with adjustable coilover dampers. With its naturally-aspirated V8 and traditional six-speed manual, the Griffith is clearly designed to put a smile on the face of driving purists. Unlike previous TVRs, however, the new Griffith is equipped with an assortment of modern electronic aids such as ABS, traction control, and fully electric steering. TVR has taken a similar approach with the interior, too. The cabin is minimalist and decidedly driver focused, yet features a centrally mounted infotainment system with a Tesla-style portrait screen. TVR says that the 90,000 GBP ($117,882) Launch Edition of the Griffith, limited to 500 units and slated for production next year, has nearly sold out. Welcome back, TVR. You’ve been missed.